Does it look like a winner yet? How about now? This picture still isn't worthy of showing how much flavor is in this container. 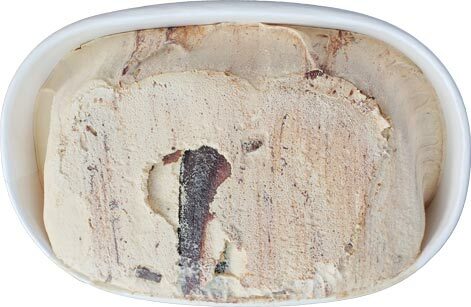 The moose tracks fudge is just so flavorful and plentiful and it plays surprisingly well with the caramel base. It's cool how the caramel ice cream enhances the complexity of the swirl. Sure, technically you probably won't taste the actual Denali caramel by itself, but who cares. Flavor town ahoy! WOOT WOOT! And the brownies? They are a factor, a very very small factor. Seriously. You will only hit them on occasion, but it's ok. What happens is that this stuff quickly melts in to a flavorful puddle of caramel base and moose track swirl bits and it's delicious. 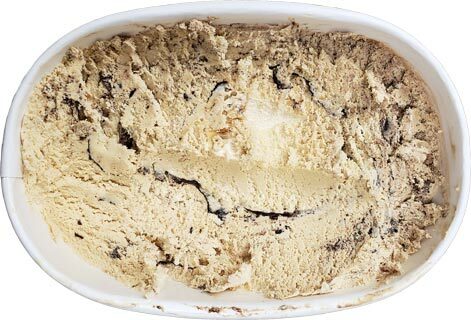 It's something akin to caramel cookies & cream, but better than that because the swirl is more rich and dense. It's pretty awesome. I've had this three times and I've inhaled it every time. You just get blasted with flavor and start thinking "more MORE MOAR!!!!". Ok, enough ranting, time for recapping. Light texture. Occasional brownie bits. Tons of flavorful swirl. Excellent combo. Easily worth the $3.09 purchase price. Give this one a try. No matter the brand, the same Moose Tracks logo is used, doe someone own the rights to moose tracks? Does a separate company have a patented way of swirling in chocolate? In general, I really like the Target Market Pantry flavors. I think they are a solid bet for the price. I have even found the vanilla and chocolate as low as 1.89 in Virginia. That is even lower than the Great Value ice cream at Wal-Mart. The one thing I like about both Market Pantry and Great Value ice cream is that I know they are ice cream. I am so done with the Breyer's Frozen Dairy Dessert. Now there is a texture that I just don't like. I still remember the good ol' days when Breyer had reliable, top notch ice cream. I think that crown goes to Edy's Natural these days in terms of mainstream brands. Yeah, I kind of miss it too. I'll be on Nerd Lunch again next week but I know that's not exactly the same as the Nosh Show. What happened to the Nosh show? I remember there was a shift in seats a while back but then I just atopped seeing posting instead of hearing that it was ending. 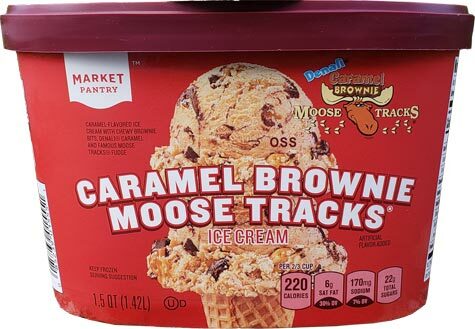 And BTW, I'm floored that some many ice cream companies choose to pay to get the moose tracks logo instead of just saying "with chocolate swirls." Cost mainly. Moose Tracks is a fairly specific thing, and it's easier to mass produce it somewhere and sell it off than it is for individual companies to make something similar. 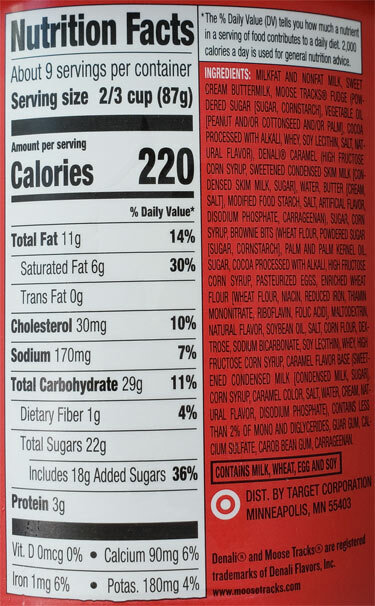 What are your thoughts on manufacturers deciding to change the calories listed to servings of 2/3 cup rather than 1/2 cup? Do you think it is an attempt to make their products appear more premium? @Amanda: thanks for the extra info! This doesn't have to do with a product you listed in this post, but it's a new product to me....Yasso pints. I picked up the chocolate and PB one. Mine had freezer burn on top. It's a froyo, not an ice cream. Once it tempered some, it was better. Definitely peanut butter is the overwhelming flavor here. My kids thought it was too hard, but they didn't wait for it to soften a bit. I got mine on clearance for 2.78 which is why I picked it up. I also picked up Museum of Ice cream chocolate with chocolate flakes. We are trying that tonight. Then I picked up Market Pantry unicorn ice cream. It's got a lot of crazy stuff inside. We got it because it said unicorn, and I have a six-year-old girl. Thanks for the info Amanda and, Dubba, I'm sure you'll find another fun podcasting outlet when you get inspired.